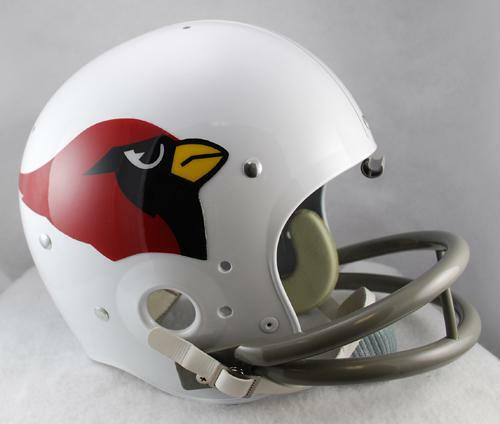 Arizona Cardinal Helmet 1960-04 TK - Login for SALE Price | Sports Memorabilia! Arizona Cardinal Helmet - 1960-04 TK Throwback Helmets by Riddell. Riddell is proud to introduce the full size “TK” suspension helmets with 2-bar facemasks as worn on-field during the ‘60s, ‘70s, and ‘80s. For a true throwback experience, the TK Arizona Cardinal helmet offers it all. The TK consists of a web suspension system in a rounded shell, with the iconic Riddell 2-bar facemask that was worn by so many great players of the past. This Arizona Cardinal helmet is a great throwback!